According to Encyclopedia Metallum, out of the six bands called Havok, the in 2005 formed Swedish Havok is by far the most successful one. After a well received demo in 2006, Havok released a single in 2007 and an EP in 2008, called Apathy Esplanade. This opened even more doors for the band. Now, a year later, Havok's first full-length Being and Nothingness reaches the Metalrage headquarters. 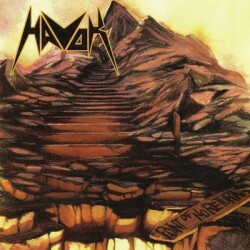 After listening to the CD a couple of times, I think that Havok are great musicians. The band's technical skills and the variation of every track are outstanding. It's hard to compare the sound to a particular band. It’s a pity though that not every part is as new and entertaining as it could have been. You could say it’s hearable that this is the band's first full-length. They try too hard to sound unique, and at the same time like a new Deicide (a comparison made by the label) or maybe Meshuggah. Also, the piano ballad 'Monologue With The Sky' is unnecessary in my opinion, and not that spectacular or meaningful. It would be much better if the band would stick to straight through, fast death metal songs like 'A Pyrrhic Victory For Humanity', 'The Ambulant Plague Of Humans' or 'Stormfeed', which I really enjoyed listening to. Overall I think it’s a band that has a lot of potential, but still lacks a sparkling style. I am, however, looking forward to review their next CD.